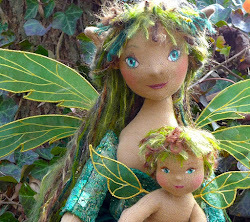 I belong to an art doll group called EGADS and recently one of the members( thanks Marjorie!) posted a link to a cool word program. Now you all know a word geek like myself couldn't resist giving this a try so I entered the URL for my shop...and I have to admit that I was a bit surprised by the results. So what is one of the largest words there? BUNNIES!!! You see what I meant in my previous post about too many? A warren of rabbits is developing in there. They really have been fun to make but it is definitely time to move on. 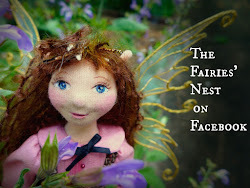 It's The Fairies' Nest not the Bunny's Nest for heavens sake. In my own defense they are so soft and snuggly, ( and the perfect size to fit in a basket...hint hint) and in truth, artists have been associating rabbits and smaller fae for a long time so perhaps I'm not too far off the mark. 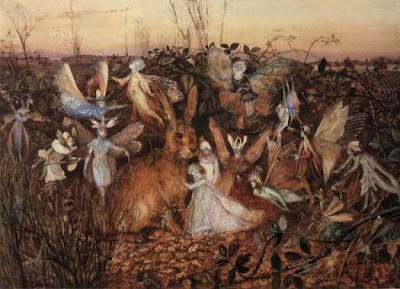 Rabbit Among the Fairies, a painting by John Anster Fitzgerald. So it is a little sheepishly that I bring you my two newest bunnies. Here shown hanging out with Milly are Jack and Isabella. 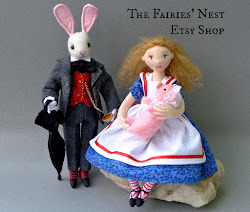 Again, through April 12th all bunnies in the shop will receive FREE SHIPPING....and just for my readers, if you put the words "march hares" in your message to buyer section, I'll give you another 5% off. And now I'm off to make something new! I love that print! It showed up on a calander I had one year, and ended up ripping it out and tucking away (don't ask me where, I've lost it - of course). Love the rabbits even more! As always, your sense of whimsy shines through. For the Love of Bunnies!